‘Humpty Dumpty…’ we know how that ends. The traditional nursery rhyme, with its surreal imagery and simple lyrics, has been a children’s classic since 1870. In the rhyme, Humpty Dumpty, an egg sits on a wall and falls, spilling his innards, while all the king’s horses and people fail to put him back together again. 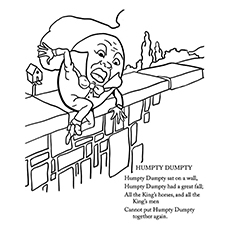 Here are 10 Humpty Dumpty coloring pages that will help your tot understand the rhyme a bit better and faster than reading it. 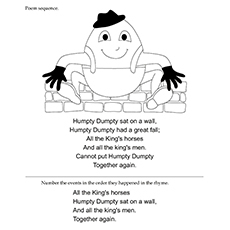 Here’s a worksheet featuring the ‘Humpty Dumpty’ rhyme along with an image of Humpty sitting on the wall. It’s a great worksheet to introduce rhyming sounds to the toddlers and preschoolers. The worksheet requires kids to number the events according to the sequence they happened in the rhyme. After doing the activity, encourage your kid to sing along while you read the rhyme to them. 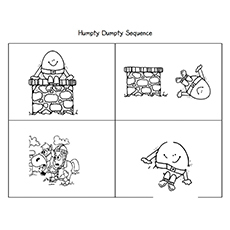 This humpty dumpty coloring page illustrates the sequence of the Humpty Dumpty rhyme. The coloring page will help the kids learn the rhyme in no time at all. After teaching them the rhyme, draw a large egg on the back of the coloring page and have the children write down the nursery poem as you dictate. It will give your kid extensive handwriting practice. 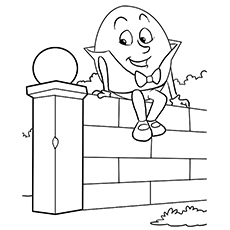 Here’s an interesting humpty dumpty coloring sheet for the preschoolers. Tell the children to go through the image and guess the rhyme. He has to circle the correct answer and then color the picture. Do you know when was this rhyme published? The nursery rhyme “Humpty Dumpty were first printed in 1810 and made popular in Lewis Carol’s book “Alice through the Looking Glass”. Here’s another fun coloring page for the budding artist in your house. Instruct your kid to colors the wall using black and red crayons. Then ask him to paint Mr. Humpty Dumpty is the shades of his choice. Do not forget to read the story of Humpty Dumpty after your kid has colored the diagram. How cute is Humpty looking sitting on the wall? He is unaware of the tragedy that he’ll be meeting in some time. A simple interpretation of the rhyme is that it warns the kids about the danger of falling from the high places like a wall. But in reality, the rhyme carries a deeper meaning. Do you have a little music lover in your house? Then here’s a perfect coloring sheet for him. This worksheet will allow your kid to practice reading the basic musical notes in both treble and bass clefs. He’ll also get to review the terms like ‘quarter, ‘time signature’ and more. But why is Humpty looking so dizzy? Didn’t he get enough sleep last night? Here’s a coloring image of Humpty Alexander Dumpty from the movie “Puss in the Boots”. 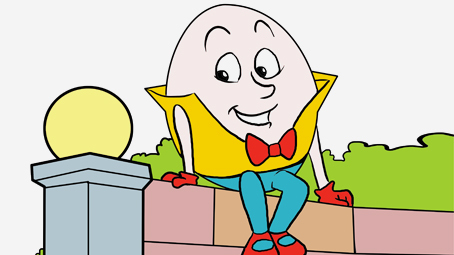 Humpty Alexander Dumpty is the secondary antagonist of the film. Humpty was the only friend that Puss had in the orphanage. They grew up playing harmless pranks on each other that soon turned into crimes. But their relationship turns sour when Puss becomes a hero after stopping a bull from killing a soldier’s head. 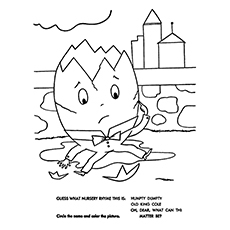 This printable humpty dumpty coloring page shows Humpty in mid-fall. The rhyme “Humpty Dumpty” referred to the cannon placed at the church called “St Mary’s By The Wall.” The cannon was put on the wall to protect the town people. When the cannon was fired during the battle, the wall cracked, causing the I to fall to the ground. Even an attempt to put together the cannon by the people was unsuccessful. 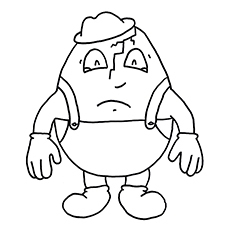 Here’s a coloring page of the broken Humpty Dumpty. The smile is all gone now. Only a bright coat of paint or color can cheer him a bit. 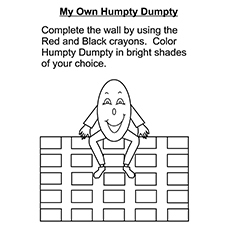 Can your child fill some bright colors in the diagram of the broken Humpty Dumpty? Children can even make a background of a wall or a town to enhance the overall look of this coloring page. 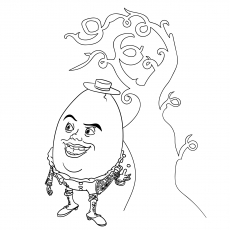 Here’s a detailed coloring page of Humpty Dumpty of the Elizabethan age. 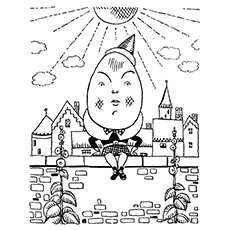 The sun is radiating its rays all over the town of Colchester, England, and Humpty Dumpty is sitting pretty on the ‘St Mary’s by The Wall”. The fine details in the color image will allow your kid to experiment with his crayons. 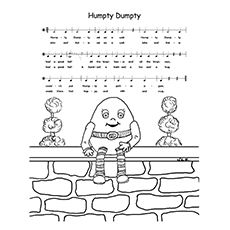 Our Humpty Dumpty coloring images will not just let your child indulge in his favorite pastime, but will also teach him about rhyme, music and language. Which is your kid’s most favorite nursery rhyme? Share with us by commenting below.